The Altarocca Wine Resort is an unusual hilltop retreat outside Orvieto, Italy that blends the rustic traditions of an agritourismo with five-star luxury amenities. The expansive views of the Umbrian hills from the terrace of our room at the Altrarocca Wine Resort were so compelling that it was hard to draw the drapes at night or even to glance away. Our cameras couldn’t fully capture the breathtaking beauty of the landscape. It appeared as if a patchwork quilt with various shades of greens had been spread on the floor of the valley below. The squares were comprised of vineyards, olive trees, sunflower and wheat fields, and newly tilled plots of the area’s volcanic clay—all connected and “stitched together” by tall cypress and oak trees. In the distance, small towns dotted the rolling hillsides as well as views of the dramatic volcanic (tufa) rock, Rocca, in the small locality of Rocca Ripesena, from which the resort derives its name. Because of its location in the countryside, the resort has the informal ambiance of a rustic agritourismo—yet offers many of the luxury amenities one might expect to find at a sophisticated hotel. The sprawling energy-efficient, contemporary resort is spread over some 30 acres with various types of room and apartment configurations available for guests. Some have kitchens, making them especially suitable for families with children. Walking the property’s very steep paths (e.g. to the pool, restaurant or parking areas), we exercised calf muscles we never knew we had. Along the way, the air felt country-fresh with abundant trees everywhere bearing olives, figs and persimmons. The fragrant rosemary bushes were so huge they looked as if they were placed on steroids. A hand-painted porcelain tile outside our door (with a modern electronic keypad) identified our room, a junior suite in the main building (Villa Gualtieri), as Rosemarino. It had a spacious private terrace outside with chairs and a table. Like the views, the furnishings and décor of our suite were dramatic. The terracotta flooring was reminiscent of an earthen floor. The neutral woods, and moss green and tan palettes used for the fabrics and walls blended seamlessly with the outdoors. An oversized canopy king bed floated in the center of the room, draped on top with romantic white gauze linen. The large air-conditioned (somewhat unusual in Umbria) room had a desk; small sitting area with a small table and two comfortable velvet-covered armchairs; as well as a flat-screen TV and free wireless Internet. Once a day cleaning (without turndown) was adequate. The modern, tiled bathroom had a bidet, oversized pedestal sink, sybaritic shower (with a half glass partition, large rainshower head, and a handheld) and large, plush towels. We stayed a week and never got bored of living in a room that looked like it came out of Architectural Digest. Altarocca offers a fitness room, bocce ball court, two pools at different locations, and a full-service spa (with a Turkish bath, whirlpool, sauna, and relaxation area). Overnight rates include a hearty buffet country breakfast each morning featuring local cheese and meats, eggs, fruits and yogurt, as well as freshly baked breads, cakes and pastries. In addition to seating in the graceful breakfast room, the placement of outdoor tables maximizes the panoramic views that extend as far as the town of Orvieto. The self-contained resort is tucked within its own picturesque vineyards and cantina (winery), which has been producing both red and white wines since 2000. In 2011, the winery went organic, eliminating the use of any pesticides. Guests can enjoy reasonably priced Altarocca wines and other drinks at the pool bar that also offers light lunches such as salads, sandwiches and snacks. The more elegant formal restaurant (also with views) is open for both lunch and dinner; it also offers al fresco dining. In addition to an extensive a la carte menu, the tasting menu (priced at 50 euros per person with wines) showcases pairings of the resort’s wines with other local products (some called “zero-mile” because they are grown on site) including olive oils, meats and sausages, grains, saffron from nearby Ficulle and truffles from neighboring Fabro. The recipes follow provincial cooking traditions. We used the resort as a base to tour Orvieto and areas beyond in Umbria, which had its tradeoffs. 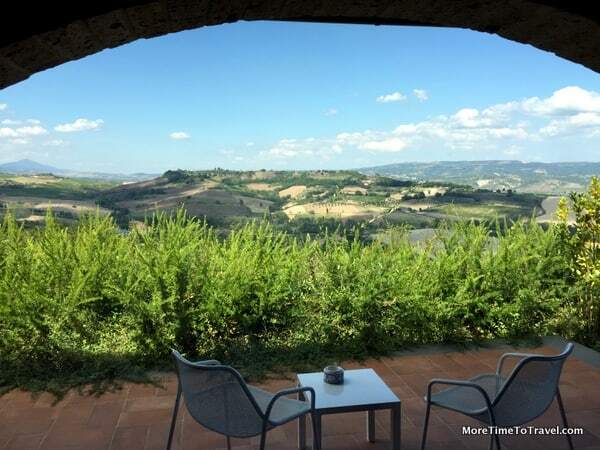 Although we loved the sunshine, fresh air, incredible views, informality and comfort—that we probably couldn’t have found in a hotel in the historic city center—Altarocca is located about 15 minutes from Orvieto by car. Each time we approached and left the resort, we had to navigate a winding two-lane road with hairpin turns, which felt like we were driving a Grand Prix. Because of its hilltop location, Wi-Fi and cell phone connectivity were often unstable. Although there was a minimally stocked minibar (with water and soft drinks) in the room, no water was provided and the price of each small bottle of water was steep: two euros. The resort isn’t fully staffed at night—but guests are given phone numbers in the event of a nighttime emergency (thankfully, we had none). The design of this resort is elegant—offering an inventive, contemporary take on Umbrian food, wine and lodging traditions. If we had the opportunity to do so, we would probably return here again, staying longer and spending more time enjoying the relaxing amenities of this one-of-a-kind resort. The resort is located about 15 minutes away from the center of Orvieto and about 1½-hours from Rome and Fumicino Airport. We paid a media rate for our room at Altarocca Wine Resort through the courtesy of the resort management and Orvieto Tourism. We paid for all other expenses involved in our stay, including meals. Any opinions expressed in this post are our own. This looks like a beautiful place. I do like that you pointed out some of the drawbacks; however, they are seemingly minor compared with a special place like this has to offer! What a pretty, pretty view! Did you like the Altarocca wines? Being organic, you’d probably not suffer any headaches the day after – that’s the part we don’t like about some red wines :-). We had a nice opportunity to sample the wines at the meal pairing in the resort’s restaurant!